Amid a run of unusually warm and dry late-autumn conditions, the imminent return of Santa Ana winds prompted the National Weather Service to issue a red flag wildfire warning for Thursday and Friday. The precautionary alert — effective in San Diego-area inland valley and mountain locales from 4 a.m. Thursday to 10 a.m. Friday — cautions the public about potentially critical fire weather due to high winds and extremely dry air. Any blazes that erupt locally over the period likely would spread with dangerous rapidity and be difficult to extinguish, the weather service advised. The gusty conditions, meanwhile, are likely to make driving hazardous in some areas, including locations along Interstates 8 and 15, according to meteorologists. Santa Ana winds will increase during the day Thursday and peak that evening or Friday morning, forecasters said. The strong air currents out of the northeast were expected to reach 30 mph, with isolated gusts up to 65 mph. Humidity levels likely will be in the single digits each day of the rest of the week, and temperatures are forecast to remain roughly 15 to 20 degrees above average each day. High temperatures in the inland valley areas will be 76 to 81 on Thursday and around 80 on Friday. 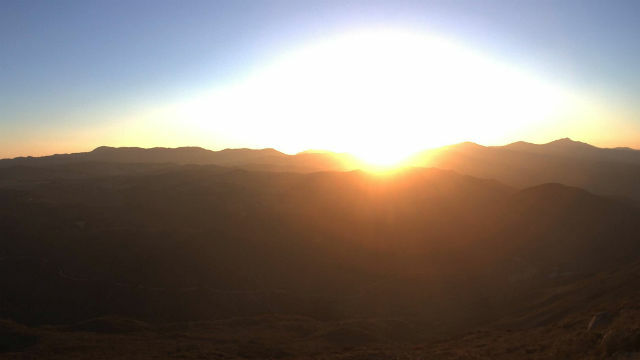 In the mountains, high temperatures will be 64 to 72 on Thursday and Friday. The warning came as firefighters continued working to fully contain the smoldering remnants of the Lilac Fire, which broke out last Thursday and scorched 4,100 acres in North County between Fallbrook and Oceanside, and as crews in Ventura and Santa Barbara counties attempt to corral the Thomas Fire, which is now the fifth-largest in state history with 236,000 acres burned.